Another week of early voting has passed and as of Sunday morning at least 5.9 million people have voted in the 2016 election. The past week of early voting marked the start of in-person early voting in states like Georgia, Nevada, and North Carolina. The in-person early voting period is a crucial time for campaigns since it is the most popular form of early voting in these and many other states. Up to 90 percent or more of the early votes will be cast in-person in these states. With this understanding, it was not surprising to see dramatic increases in the volume of early voting. In-person early voting is also the preferred method of voting among Democrats. 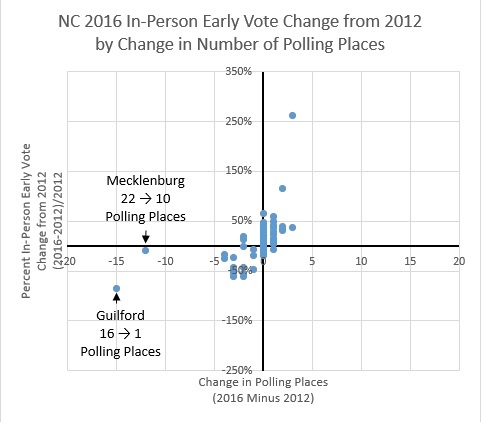 In places like North Carolina, Republicans had finally built a lead in the mail ballots, only to see that lead dramatically erased after the first day of early voting. This pattern is expected from previous election cycles, so it is not in itself indicative of how the election may play out. Comparisons of early voting to 2012, added to polling numbers, provide better context as to where the election may be heading. That said, there are still two weeks left in the election and unpredictable events may yet affect the eventual outcome. I begin with North Carolina, where in-person early voting began on Thursday. On Wednesday, registered Republicans held a lead of 2,641 returned ballots over registered Democrats, or a lead of 4.7 percentage point lead among all returned ballots. Then in-person early voting started, and 385,410 voters cast ballots in-person by the end of Saturday. 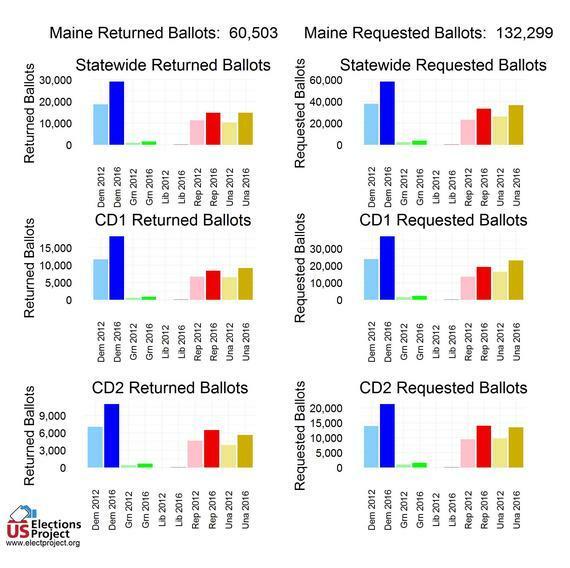 The number of registered Democrats voting increased dramatically, and they jumped into a lead of 80,303 returned ballots over Republicans by the end of Saturday, or a 13.9 percentage point lead among all returned ballots. 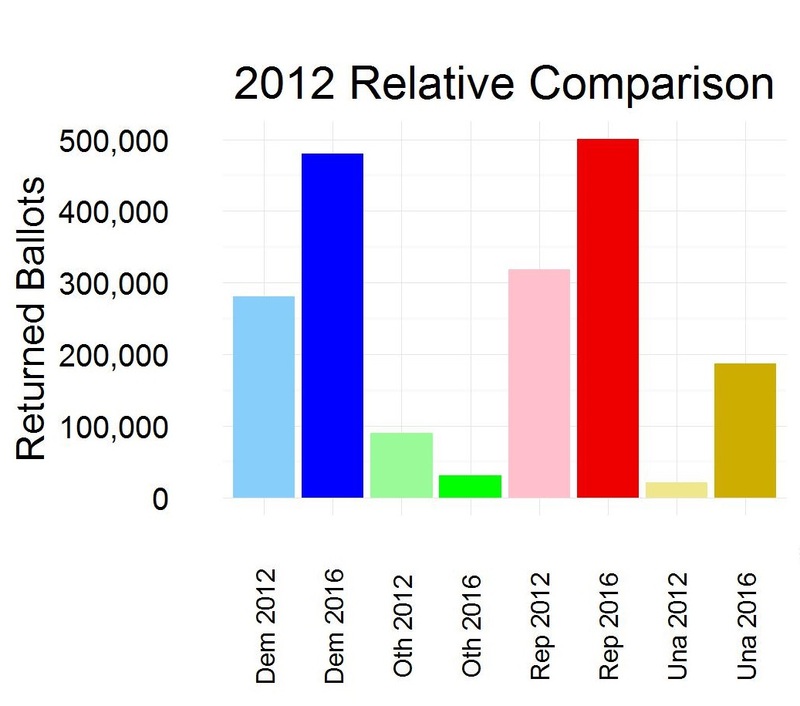 Republicans have been less engaged than 2012 during the entire mail balloting period, and this pattern persists through to in-person early voting. As of Saturday, Republicans are running behind their 2012 levels by 26,324 returned ballots for a 13 percent decrease from 2012. A potential worrisome issue for the Democrats is that their levels have been up over 2012 until the in-person early voting period started, but now trail their 2012 levels by 15,198 for a 5.7 percent decrease from 2012. Defying the party trends, early voting levels among voters who are not registered with a party (what North Carolina calls "Unaffiliated") is up from 2012 by 32,234 for a 28.6 percent increase over 2012. 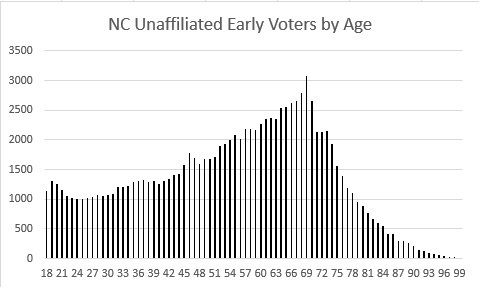 This slice of North Carolina early voters may lean towards Trump, as the age distribution of all Unaffiliated voters tends to skew older. Still, note the skew is not that great as there are a generous number of younger voters, too. Democrats may be off their 2012 levels not due to disengagement, but due to the availability of in-person early voting. Local electoral boards, with Republican majorities, created bottlenecks by reducing the number of in-person early voting polling locations. They did so at the urging of the Republican state party chair. Not all local boards listened, but some did, and the effect is obvious. The volume of early voting is generally down in the counties that reduced the number of polling locations and is up where the number increased. Perhaps the most egregious county is Guilford, a county of 517,600 people, of which 57.9 percent is White, and gave Obama 58 percent of the vote in 2012. The county opened 16 in-person early voting locations in 2012, but has only their central election office open in 2016. The number of in-person voters on the first Thursday and Friday was 21,560 in 2012, but was only 3,305 in 2016, a decrease of 18,255 or 85 percent. Mecklenburg, where the state's largest city Charlotte is located and a county Obama won with 61 percent of the vote, decreased their number of polling locations from 22 to 10. The effect was not as pronounced as Guilford. The number of in-person voters on the first Thursday and Friday was 29,068 in 2012, and was 26,660 in 2016, a decrease of 2,426 or 8 percent. Many North Carolina counties will expand their in-person early voting polling locations the week before the election. Guilford will have 25 polling locations open at later points in the early voting period and Mecklenburg will have 22 (particularly the last week). In the past, the volume of early voting has increased as the election nears, so these actions to reduce turnout may not be entirely effective. Clinton has a narrow lead in the North Carolina polling averages, and Democrats are still engaged at higher levels than Republicans. I imagine that the Clinton campaign is nervously watching these early voting numbers to see if voters in these heavily Democratic counties will engage once past the current bottleneck created by the shuttering polling locations at the beginning of the early voting period. Looking at the party registration numbers, Jon Ralston reports registered Democrats are voting above their voter registration levels, up 12 points in Clark and 11 points in Washoe. Republicans are running below their voter registration levels, down 2 points in Clark and 1 point in Washoe. Ralston was careful to document how Republicans outperformed in 2014, so Trump supporters should take heed when he says, "Democrats destroyed Republicans in the first day of early voting in Nevada." There is nothing in these early voting numbers that contradict recent polling showing Clinton taking a lead in the state. Iowa continues to be a weak point for the Clinton campaign, as Trump continues to out-perform Romney by having a moderate lead in the polling averages in a state Obama won by 5.6 points. The situation has improved slightly for the Democrats in the past week. Democrats are expected to lead in the early vote (Iowa state calls mail ballots and in-person early votes "absentee" so there is no way to distinguish mail balloting from in-person early voting that started a couple weeks ago.) There really was no direction but up for Democrats, who were running as far as over 50,000 ballot requests behind their 2012 levels. As of Friday, they are down only 34,447, while Republicans are up 2,540. The Iowa polling showing weakness for Clinton appears to be correct. However, there has not been much polling in the state and it is possible the state is shifting in a Democratic direction. Will that be enough for Clinton remains to be seen. Paul Mitchell, vice-president of a California political consulting firm called Political Data Inc., publishes California mail ballot statistics, which show heightened levels of mail balloting compared to 2012. Of particular interest is the party breakdown. Registered Democrats have returned ballots at 25 percent over 2012 and Republicans are up only 6 percent (there has been a general increase over time of mail balloting in California). That Clinton will likely win California is not surprising. Perhaps most consequential to understanding dynamics in surprise battleground states like Arizona and Texas is that California Latino's mail balloting is up 45 percent over their 2012 level, the highest increase for any group. ("Latino" is determined in a state like California, which doesn't ask race on its voter registration forms, by matching voters' surnames with a list of Latino surnames created by the Census Bureau.) Latinos usually vote at about 20 percentage points lower than Whites or African-Americans in past presidential elections. If Latino engagement persists through to Election Day and expands beyond California, this would fundamentally alter America's political map, particularly if Latino participation continues in future elections. In-person early voting starts Monday in Florida, so we might expect similar changes soon in Florida in a Democratic direction as witnessed in states like Nevada and North Carolina that mix mail balloting and in-person early voting. Overall mail balloting levels are up bigly from 2012. Election officials have received 1.2 million mail ballots as of Saturday, which is an increase of about a half million more from the same time in 2012. This is due to a change in state law that makes a ballot request good for two years. Some counties also have a check box on their mail ballot return envelopes, which serves as a request renewal. 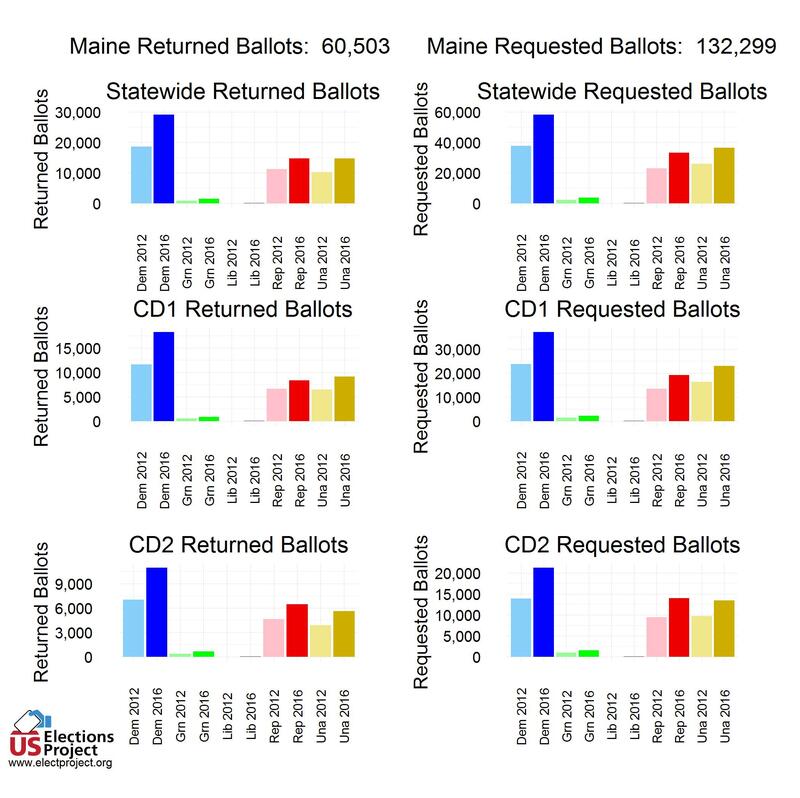 At a comparable time in 2012, registered Republicans had a lead of 5.3 percentage points over Democrats in returned mail ballots (we only have returned ballots for 2012). As of Saturday, the Republican lead was 1.6 percentage points. These numbers are confounded by the change to the mail balloting law and some indications of lingering effects of Hurricane Matthew on Republican areas of Northeast Florida. The Florida poll averages show a narrow lead for Clinton, outside the margin of error. There is nothing in the early voting that would contradict that assessment at this time. However, like North Carolina, the in-person early voting period will be the critical time for the campaigns. Perhaps voters have simply chosen to vote earlier, and by a different method, than in 2012. Maybe in-person early voting will not be as strong as 2012. We should have a clearer picture in the next week once a week of in-person early voting has occurred. Ohio does not have party registration in that same way that other states do. Election officials record the last party primary a voter a person participated in this open primary state as their "party". So, instead of a party analysis, I believe that a geographic analysis is most informative. In the Democratic strongholds of Cuyahoga (Cleveland) and Franklin (Columbus), mail absentee ballot requests are running 17.7 percent behind their 2012 levels in Cuyahoga and 10.3 percent behind in Franklin. (Ohio calls in-person early votes "in-house" mail ballots and groups them with other mail ballots.) With the assistance of UF graduate student Brian Amos, we have scraped many of the local election websites and analyzed their absentee ballot files. In 49 other Ohio counties, absentee ballot requests are up 5.1 percent. There are some changes since 2012 that may affect these numbers. Early voting was offered for a longer period in 2012. The Secretary of State mailed out ballot request forms to all registered voters in 2012, but only those who voting in 2012 or 2014 this election. 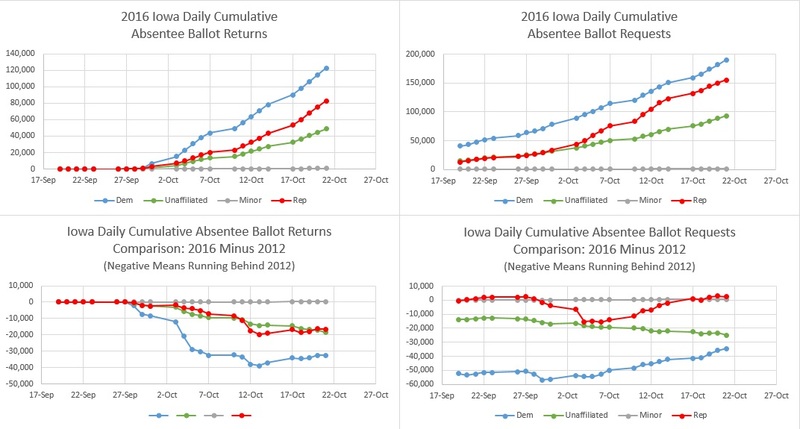 Still, even since the in-person early voting period started last week, the ballot request numbers from these counties continue to flat line. The Pollster average has a slim Clinton lead in Ohio, within the margin of error. I believe this is correct. Even as Clinton has opened a large lead in national polling, Ohio has not matched that surge. I will only briefly mention that Clinton shows polling improvement in Maine, and since the first debate Democrats are exceeding their 2012 levels in Maine's Second Congressional District. I think the likelihood Maine will split its Electoral College votes between the two congressional districts is fading (Maine and Nebraska are the only two states that do this), barring some unforeseen event. Virginia is another state where hopes for a Trump victory are fading, barring some unforeseen event. Although Virginia requires an excuse to vote an absentee ballot, the excuses are fairly lenient and the state usually sees double-digit rates of early voting. A Virginia Public Access Project analysis (they're a non-profit; give to them if you like what they do), shows Northern Virginia is running ahead of its 2012 levels by 63 percent, whereas other regions are running slightly ahead or behind their 2012 levels. The polling averages have a significant Clinton lead in Virginia, and both campaigns have pulled out. The early voting numbers are just one more straw on the already broken back. More interesting, perhaps, is the long-run implication that Virginia may no longer be a battleground state in presidential elections. If the election were held today...what am I saying? In many places the election is being held today and for the next two weeks through to November 8. Despite weakness for Clinton in the Midwest, Clinton looks well-positioned in other states Trump still needs for an Electoral College victory. We are entering the crucial in-person early voting period for Democrats. Democrats tend to vote at higher numbers than Republicans during in-person early voting, a behavior that is being born out in critical battleground states like Nevada and North Carolina. There are some clouds in North Carolina, as Democrats stand in long lines created by the opening of fewer polling locations in some key Democratic counties. Will Democrats endure through to Election Day? Will in-person early voting wind up not as favorable for Democrats as it has been in the past? The next two weeks of in-person early voting will tell the tale. In collaboration with the Associated Press Election Research Group, I disseminate early voting statistics from across the country. I provide snap analyses through Twitter @ElectProject.